NEW ORLEANS – Just because a lot of teams were resting up for one of the biggest regular-season weekends in recent history, doesn’t mean other teams weren’t making some noise on the national landscape themselves. 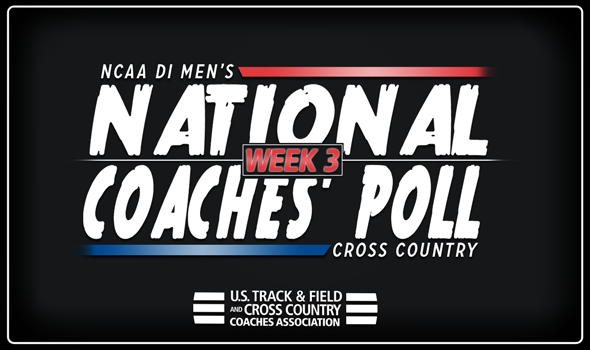 In fact, the NCAA Division I Men’s Cross Country National Coaches’ Poll underwent a lot of change between Week 2 and Week 3. The most recent installment, released Tuesday by the U.S. Track & Field and Cross Country Coaches Association (USTFCCCA), saw 19 teams shift spots – including four that went multiple spots in the positive direction. Nothing changed in the top-7 as the teams that have been there since the beginning of the season remained there in Week 3. Northern Arizona headlines the group and is now the longest reigning No. 1 program in the past decade. BYU, ranked No. 2 for the eighth consecutive week, continues to pace the contenders. Portland, Stanford, Iowa State, Alabama and Colorado sit third, fourth, fifth, sixth and seventh, respectively. Syracuse jumped two spots from No. 10 to No. 8 after a dominant effort at the Coast-to-Coast Battle in Beantown. The Orange put its entire scoring lineup in the top-15, led by individual runner-up Aidan Tooker and fifth-place finisher Noah Affolder. Syracuse finished with just 37 points and won the meet by 33 (Washington ended up with 70). Speaking of those Huskies, Andy Powell’s squad soared 14 spots between Week 2 and Week 3. Washington is now ranked 12th, which matches its best billing in the past two years. The Huskies had three runners in the top-15 paced by Oregon transfer Tanner Anderson in sixth place. Ole Miss vaulted 10 spots between Week 2 and Week 3 from the fringe of the top-30 at No. 30 to No. 20. This marks the fourth year in a row that the Rebels have cracked the top-20. Ole Miss improved its spot in the National Coaches’ Poll after finishing third at the Coast-to-Coast Battle in Beantown this past weekend. The Rebels were just seven points out of second place. Even though there are a number of meets across the nation that pulled ranked teams, all eyes are on the Nuttycombe Wisconsin Invitational in Madison, Wisconsin. That’s because 19 teams that are ranked in this poll – including SEVEN in the top-10 alone – will contend for the team title on the Thomas Zimmer Championship Cross Country Course, the same course that will host NCAAs on November 17. Other meets this weekend include the Greater Louisville Classic (featuring No. 19 Middle Tennessee State), the Joe Piane Notre Dame Invitational (featuring No. 2 BYU and No. 28 Furman), the Paul Short Run, the Roy Griak Invitational and the Stanford Invitational. Be sure to check back throughout the season as the National Coaches’ Poll will continue to evolve ahead of the aforementioned NCAA Division I Cross Country Championships. WHERE IS THE COUNTRY COMPETING THIS WEEKEND?